The following establishments cater for clients with different accommodation needs ONLY. Please contact them should you require accommodation while training. 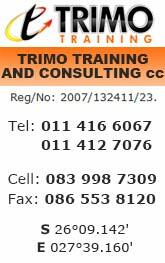 To contact Trimo Training Provider CLICK HERE. Latitude -26 degrees 09' 52" South.